Team building -do it right and you will reap the rewards. Are you looking for some fun ideas for your next corporate event? Perhaps you want to treat your staff, motivate them or reward them for their efforts in completing a project. Or maybe you want to break down barriers and develop a rapport with your team. Successful team building activities increase staff morale and productivity and can help create a positive atmosphere at work. Acorn Wood Glamping offers a stunning backdrop to any team building break. A glamping break enables your staff to enjoy a unique experience together and should help to bring your team closer. It is an ideal way to welcome new team members as it is a fun enjoyable experience in a relaxed environment – noting too structured or pressurised. If you are hoping to increase your staff’s creativity and problem-solving skills, then a couple of hours in the local Escape Rooms might just be the answer. A campfire under the stars is the ideal way to unwind and relax after a day’s activities. 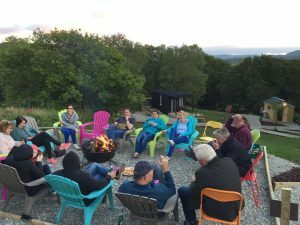 Show your staff that you value their contribution -treat them to a glamping trip at Acorn Wood Glamping.